Dryer Vent Cleaning Bloomfield CT 860-558-0395 Dryer vent cleaning, dryer vent repair, dryer vent installation and dryer exhaust issues in Hartford, Bloomfield, Wethersfield, Glastonbury, Avon, Manchester, Windsor Locks, Enfield, Granby, Suffield, West Hartford, Bristol, Farmington, South Windsor, New Britain and neighboring cities and communities. Increased drying time and poor dryer performance is almost always caused by a clogged dryer vent…the good news is maintenance service by the Wizard will have the old dryer running like new again! Bloomfield CT – The Dryer Vent Cleaning Wizard explains the function of the dryer and dryer vent system as he relates the good news to customers who complain about increased drying time. When a dryer operates inefficiently, the good news is there is no need to call for repair or go out and buy a new dryer. The better news is dryer vent cleaning by the Wizard is the solution to fix the problem and eliminate a fire hazard. 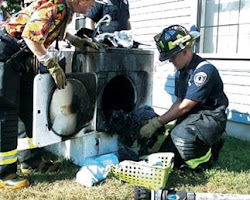 Poorly vented dryers are the leading cause of over $17,000 dryer fires. Poorly installed dryer vent systems are also a contributor. These same problems are often the cause of increased drying time and poor dryer function. Most appliances that begin to function improperly require a service technician or are just worn out. Clothes dryers are the exception to this rule. Most dryer problems are the result of poor ventilation, not aging, wear or malfunction. 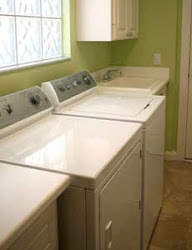 The primary function of the dryer vent system is to carry heat and moisture from the dryer drum to the vent outdoors. Many people believe it is should remove dryer lint as well; however, most lint trapped in the dryer and dryer vent system remains there until it is cleaned out. The Wizard (http://ctbloomfield.dryerventcleaningnow.com/) provides professional dryer vent cleaning service to restore airflow so even an older dryer will perform like new again. John Moffat owns Dryer Vent Wizard, serving residents and business owners in West Hartford, Bloomfield, Wethersfield and nearby cities and communities. Dryer Vent Wizard specializes in dryer vent cleaning, repair and new dryer vent installation while educating residents about dryer safety and energy savings. Visit http://www.dryerventcleaningbloomfieldct.com/ to learn more. Bloomfield, CT – Dryer vent installation is not too hard to do; but, there are a few common mistakes homeowners or general handyman service make. Many homeowners have attempted to install their own dryer vent system and felt they did OK. The question is have they done it correctly? Dryer vent installation involves some very important rules that are critical to the safe function of a clothes dryer. 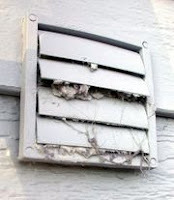 John Moffat, owner of Dryer Vent Wizard (http://www.dryerventwizard.com), often receives calls from frustrated residents who need dryer vent installation service. Many are told that a technician will not be available for a few days or a week. The Wizard would never make someone wait that long to get their laundry done! John Moffat owns Dryer Vent Wizard of Hartford County, specializing in professional dryer vent installation and service for homes and businesses with clothes dryers. He treats all dryer vent service calls as urgent because he knows that the customer could be in danger if they continue using their dryer when service is needed. John Moffat knows that poorly installed dryer vent systems can be a fire hazard or cause clothes dryers to perform inefficiently, leading to mechanical break-down or high energy bills. His concern with making a customer wait too long for his services is they might try to do the job themselves, and make a critical mistake that cost them their home or even their lives. Professional dryer vent installation and regular dryer vent cleaning service by the Wizard ensures proper air flow needed for clothes dryers to work safely and efficiently. New clothes dryers should be professionally installed by a dryer exhaust technician who will make sure the dryer vent system meets current city, state and manufacturer’s safety standards. Dryer Vent Wizard specializes in “urgent response” dryer vent cleaning, repair and installation. John Moffat handles consumers and business owners in Hartford, Tolland and Windham counties in Connecticut. Visit http://www.dryerventcleaningbloomfieldct.com/ to learn more. The Bloomfield Dryer Vent Cleaning Wizard is on a mission to eliminate fire hazards and prevent other dryer related hazards to the home. The home is probably the most important investment any family will make. But there lurks a danger in the home that many people ignore. This danger is so real that many home insurers are now addressing the problem by making mandatory inspection of the dryer vent system before they will insure. Why is the home dryer vent hose and system so important? John Moffat, owner of Dryer Vent Wizard explains the importance of proper maintenance to his customers. He explains how the dryer functions by removing moisture during the heating of wet laundry. The moisture is held in the warm air produced by the dryer in the form of humidity and vented outside through the dryer vent hose. Deferred maintenance will lead to clogs in the system, loose fittings and possibly even cracks in the dryer vent hose. Visit http://www.HartfordTollandWindhamCountyCT.DryerVentCleaningNow.com to schedule an inspection. Each load of laundry contains about a half a gallon of water. Lint is created from clothing as water is removed during the drying process. The lint builds up in the lint filter trap, which only catches about 60 percent. The rest becomes trapped in the dryer vent system. The moist lint begins to line the inside of the hose building up over time until air flow is restricted and a clog occurs. Anytime during this process a fire can break out as lint is highly flammable and with restricted air flow more heat builds. An easy way to eliminate the danger is to contact the Bloomfield Dryer Vent Cleaning Wizard for an inspection. An inferior dryer vent system can lead to mold and mildew problems in the home. When there is excess humidity in the laundry room, the problem is often related to poor venting. This creates an opportunity for mold and bacteria to grow and cause problems for residents with allergies or weak immune systems. Dryer Vent Wizard specializes in the inspection and maintenance of commercial and residential dryer vent systems. John Moffat serves homeowners and business owners in Connecticut, Hartford, Wethersfield, Bloomfield and nearby cities and communities. Visit http://www.dryerventcleaningbloomfieldct.com/ to learn more. Dryer Vent Cleaning Bloomfield to Save over $300 per Year! Dryer vent cleaning Bloomfield: Dryer vent cleaning should be performed annually to prevent dryer fires and to keep your dryer running efficiently. When a dryer vent system becomes clogged with lint, air flow is blocked, causing excessive heat build-up and eventually resulting in a fire. Poorly vented clothes dryers can increase energy bills by up to $300 per year. Overworked clothes dryers, as a result of clogged dryer ducts, are susceptible to pre-mature breakdown resulting in expensive appliance repair bills. The lint screen catches about 60% of lint that is removed from your laundry as it dries. Clean the lint screen after EVERY load to promote maximum air flow. Wash the lint screen every few months with warm soapy water to remove residue build-up from dryer sheets. This is good care for in between annual dryer vent cleaning services. If you begin to notice your dryer taking several cycles to properly dry a load of clothes then there is likely a blockage in the dryer vent system restricting air-flow. When lint is allowed to build up in the dryer ducts heat and moisture cannot escape the dryer drum; therefore, clothes do not dry. This is the most common indicator that dryer vent cleaning is necessary. When the dryer is running, go outside and check the dryer vent to be sure air is escaping. If you do not see dryer exhaust air coming from the vent then there is a clog in the system. Dryer vent cleaning is necessary to remove lint build-up and to allow your clothes dryer to work efficiently. It is best to have a professional dryer vent cleaning and dryer exhaust specialist do the job. The dryer exhaust duct will need to be disconnected from the back of the dryer and cleaned with special tools. The service technician will also clean inside the dryer. Lint is very messy and a lot of it gets past the lint screen and builds up inside the dryer and throughout the dryer exhaust system. Some dryer exhaust ducts are short, straight and easy for the average homeowner to access and clean where others are longer and have areas that are difficult to reach. Remember, lint has no problem getting into these hard to reach areas and building up. A professional dryer vent cleaning technician has the necessary tools and expertise to perform the job. Dryer vent cleaning should be done at least once a year so that your clothes dryer is operating efficiently and safely. When a clothes dryer takes longer than usual to dry a load of laundry, this is a sign of lint build-up and reduced air-flow. Rarely does it mean that the clothes dryer is old and wearing out. Annual dryer vent cleaning should be part of your appliance maintenance routine. Proper maintenance on appliances promotes safety and saves money on energy costs. It will also reduce the chance of mechanical break-down and prolong the life of your appliances. Dryer vent cleaning can save over $300 per year in energy usage alone. Dryer vent cleaning extends dryer life and prevents mechanical problems, prevents fires and more. Save money and enjoy peace of mind…call the Wizard for a complete inspection of your dryer vent system. John Moffat, owner of Dryer Vent Wizard provides dryer vent cleaning, dryer vent repair and dryer vent installation for homes and businesses in Hartford, Tolland and Windham Counties, Hartford, Bloomfield, Wethersfield, Glastonbury, Avon, Manchester, Windsor Locks, Enfield, Granby, Suffield, West Hartford, Bristol, Farmington, South Windsor, New Britain, Vernon Rockville, Ellington, Willington, Coventry, Andover, Amston, Mansfield Center, Woodstock Valley, Eastford, Thompson, Brooklyn, Hampton, Windham, Danielson, Plainfield Village, and neighboring cities and communities. Dryer Vent Cleaning, Bloomfield: Dryer vent cleaning and proper dryer vent maintenance is the number one way to prevent dryer fires. With over 15,000 clothes dryer fires occurring each year, causing deaths, injuries and loss of homes, it is important that we work to increase public awareness of preventing clothes dryer fires. Most of the reported fires were due to improper dryer vent cleaning and maintenance. It is recommended that all dryer vent systems be inspected by a dryer vent professional to ensure that they are up to code and working safely and efficiently. Dryer Vent Wizard will do a thorough inspection of your dryer vent system to be sure it is made of proper construction and that it is properly installed. They will do the necessary corrections to be sure that it meets current UL safety standards. Dryer Vent Wizard provides dryer vent cleaning, repair, maintenance, installation, and dryer vent systems inspections for residential and commercial buildings. They strive to educate consumers on dryer vent cleaning and maintenance for fire prevention. • Develop a fire safety and emergency fire-escape plan for your household. Besides fire safety and prevention, proper maintenance insures your clothes dryer will operate more efficiently, and cost less to operate, saving on energy costs. Dryer Vent Wizard has a policy that all technicians help educate their customers. Their job is not complete until the customer understands the function of their dryer vent system and how they can help maintain it between annual professional visits. Dryer Vent Wizard is the most reliable dryer vent cleaning company in Connecticut, with three Wizards who manage professional dryer exhaust technicians across the state. Call the Wizard first; they are ready to service dryer vents the same day they’re called. Choose the Wizard if you do not want to wait a week for dryer vent services while your dirty laundry piles up. Clothes dryers are not only among the most expensive appliances to operate, they are also the most likely appliance to start a fire. Dryer vent cleaning promotes maximum dryer performance to make dryers safer and greener. Services performed by the Wizard ensure clothes dryers are fire-safe and energy efficient. Each Dryer Vent Wizard is independently owned and operated; but all Wizards are working toward a common goal to make one million clothes dryers safer and greener each year. Dryer Vent Cleaning - Get the Lint Out! Dryer vent cleaning, dryer vent repair, dryer vent installation for homes and businesses in Hartford, Tolland and Windham Counties, Hartford, Bloomfield, Wethersfield, Glastonbury, Avon, Manchester, Windsor Locks, Enfield, Granby, Suffield, West Hartford, Bristol, Farmington, South Windsor, New Britain, Vernon Rockville, Ellington, Willington, Coventry, Andover, Amston, Mansfield Center, Woodstock Valley, Eastford, Thompson, Brooklyn, Hampton, Windham, Danielson, Plainfield Village, and neighboring cities and communities.